HONOLULU, HI -- (MARKET WIRE) -- December 5, 2005 -- Kamakura Corporation announced today that its monthly index of troubled companies in the United States improved slightly in November, after a sharp jump in October. Kamakura's troubled company index reached 13.2% of the public company universe, down from 13.8% in October. The troubled company index has moved in a narrow range between 13% and 14.5% for the last six months. 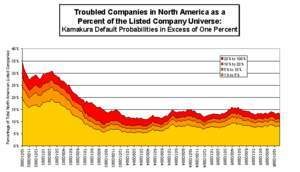 Kamakura classifies any company with a default probability of more than one percent as troubled. "The narrow variation in the troubled company index includes a steady increase in the number of companies with default probabilities in excess of 20%," said Warren Sherman, Kamakura President and Chief Operating Officer. "Currently, there are 168 companies in North America with default probabilities over 20%, the highest absolute number since October 2004. As a percent of the whole public company universe, these risky firms jumped 0.4% to 2.3% of the universe in November. Last month, the number of companies with default probabilities between 1% and 5% eased to 7.8% of the universe from 8.6% in October. Companies with default probabilities between 5 and 10% were steady at 1.9% of the universe compared to a month earlier. Companies with default probabilities between 10% and 20% declined slightly to 1.3% of the universe from 1.4% in October." Kamakura is offering free trials of its KRIS default probability and default correlation service to qualified institutions. For more information on Kamakura's free trial offer please contact Kamakura at info@kamakuraco.com. More information can also be found on the Kamakura Corporation web site www.kamakuraco.com and in "Advanced Financial Risk Management" (John Wiley & Sons, 2004) by Kamakura's van Deventer, Kenji Imai, and Mark Mesler (available on www.amazon.com). "Advanced Financial Risk Management" was recently named "best finance book of 2004" on www.riskbook.com. Kamakura Corporation is a leading provider of risk management information, processing and software. Kamakura has been a provider of daily default probabilities and default correlations for listed companies since November 2002. Kamakura launched its business mortality model for unlisted companies in January 2004. Kamakura is also the first company in the world to develop and install a fully integrated credit risk, market risk, asset and liability management, and transfer pricing software system. Kamakura has clients ranging in size from $3 billion in assets to $1.6 trillion in assets. Kamakura's risk management products are currently used in 17 countries, including the United States, Canada, Germany, Switzerland, the United Kingdom, the Middle East, Africa, Australia, Japan, China, Korea and many other countries in Asia.